The Map Archives include a variety of maps created for many different purposes, and collected over the years from donations and purchases. The archives contain more than 15,000 items, many of which are currently available in our online catalog. Reproductions of our most popular maps are available to purchase in the Research Center and in the online store. Maps that have been scanned are available to view in the online catalog. 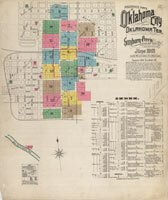 The inventory of holdings can be found under the Oklahoma Historical Society Map Collection. Custom orders of maps not listed in our catalog will be priced based on map condition and size. Please allow six to eight weeks for custom map orders. 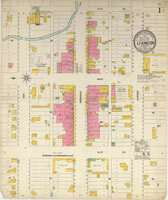 The OHS accepts original maps that are hand-drawn, printed, or published. Copies of maps from Oklahoma state agencies or United States federal agencies are discouraged, as they are available elsewhere. The Map Archives contain a variety of cartographic materials. These are just a few examples. Fire insurance maps were created as a product to help fire insurance companies assess the potential risks involved in underwriting policies. A survey was taken every two to three years for each town, and the maps you see here were created. Small communities may fit on one sheet where larger cities are mapped over many pages. The examples seen here were created by the Sanborn company that is still in the business of geospatial mapping today. The maps from government reports include those submitted with Reports to the Commissioner of Indian Affairs as well as others. 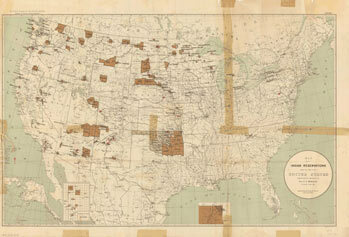 This example shows a map created from the information taken in the 11th United States Census of 1890 under the direction of T. J. Morgan, the Commissioner of Indian Affairs. 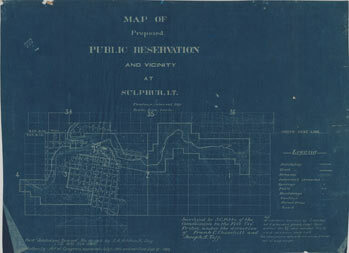 This map is a survey of the town of Sulphur and the surrounding areas, showing the proposed land for a public reservation, now known as the Chickasaw National Recreation Area, maintained by the National Park Service. This map was created for the Commission to the Five Civilized Tribes in 1902. Maps containing geographic and topographical information are also included. 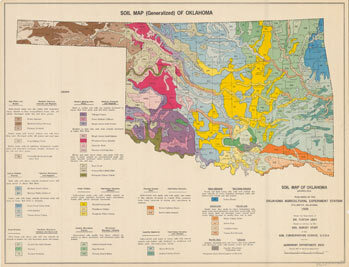 This map shows the soil variations throughout the state of Oklahoma. It was created by the Agronomy Department of Oklahoma State University, Stillwater, in 1959. The mapping natural resources has a long history in Oklahoma; the Oil & Gas Journal is a publication out of Houston, Texas, devoted to the petroleum industry. 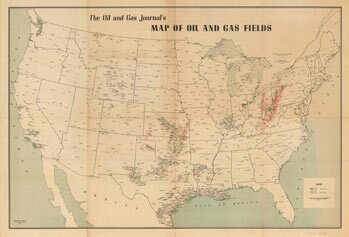 This map was created as a supplement to the June 5, 1941, issue and features oil and gas fields across the United States.